Since no code had changed this seemed incorrect (only had done a composer update, no code changes). Further investigation shows that PHPUnit is incorrectly reporting random arguments in methods and functions as not covered (even though they are). In the example above, you can see that 4 tests actually cover that method, but it is saying that 1 argument is not covered. That seems impossible, since I have to call that method with those arguments. Especially since these tests are actually functional tests. Previously, these tests showed full coverage accross all metrics (Line, Functions and Methods, Classes and Traits), now, Lines show 100% but not Functions and Methods or Classes and Traits. As you can see, this is fully a functional test that should cover all the lines. PHPUnit reports they are not covered? 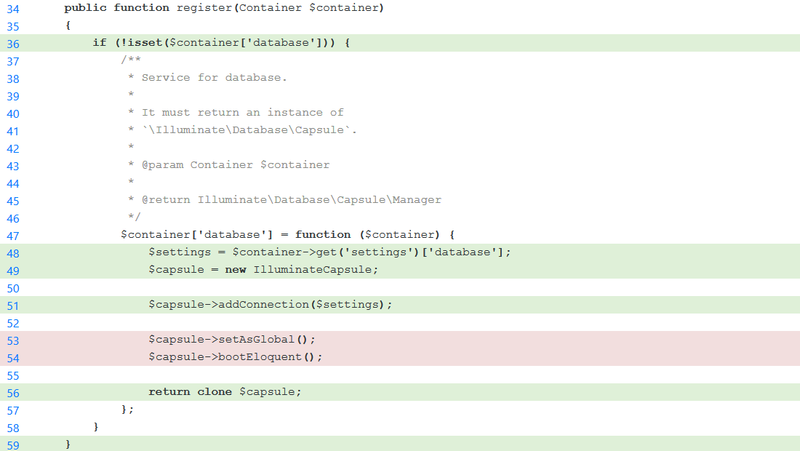 This is causing all my reports and CI to break, since it uses phpunit to determine coverage thresholds. [09:47:59] [vagrant@isengard] /vagrant [][develop ✓] →  php -i | grep -i "xdebug"
Seems that anywhere I use a mock (i use mockery), or symfony functional tests, phpunit is not honoring that coverage under the Methods & Functions | Classes metrics...it did not that long ago. Can you please use PNG insteaf of WebP for the screenshot? GitHub is not able to display that inline for some reason. Are you able to see this one? The otherone was PNG also. Not sure why it didn't display. They all display properly on my chrome brower under linux and osx. I did also do an install with ansible on my build box where i first saw the issue (it's a continuous build so it could have updated xdebug), then i started seeing it on my vagrant box after a destroy and up and destroying compoer dir to try to replicate locally. Just adding a bit more info. The behavior is extremely bizarre. @sebastianbergmann — Can't say without having the full source file. What source file? The controller showing the lack of coverage? On May 11, 2017 07:13, "Derick Rethans" ***@***. ***> wrote: @sebastianbergmann <https://github.com/sebastianbergmann> — Can't say without having the full source file. — You are receiving this because you authored the thread. Reply to this email directly, view it on GitHub <#526 (comment)>, or mute the thread <https://github.com/notifications/unsubscribe-auth/ABbK_lWlvc3fENarseXF6e6ZTsfAySySks5r4xd_gaJpZM4NXwfC> . These are functional tests, and before were reporting 100% coverage across all metrics (as they should). What makes less sense is that they are missing coverage on things like the second argument of a method. That's just odd. Looks like this is not an issue with this component (or PHPUnit). Either the PHP compiler does not generated opcodes for the sourcecode lines in question or Xdebug does not recognize them. Not sure if it's possible for someone to test this on a version of PHP before 7.0.19 and see if something in that release broke it? I literally cannot have code coverage guard turned on anywhere, cause it says it is not covered.... What can we do to get this fixed please? Covers explicitly those lines. PHPUnit runs that tests. Please provide a minimal, self-contained, reproducing test case that shows the problem you are reporting. In your specific case this means that no framework code etc. is used/required that is affected by annotations. Without such a minimal, self-contained, reproducing test case I will not be able to investigate this issue. I think since 7.0 I started to see it very often. I found phpdbg gives accurate results. It increased my coverage, but it still didn't fix the last outlined item. It still however lacks coverage in the symfony framework functional test case. That may yet be a bug with this. @vpassapera — There can be many reasons why a specific line is not covered. Each of them are likely a different issue. In order to be able to reproduce anything and not get bogged down with details, you need to provide the following in ONE new issue per case. Either a .tar.gz archive or a GitHub repository with a reproduce case. With one file that shows the problem and one test case file (with the exception that sometimes, you might need two source files to show a problem. This information should be file as one specific case per issue. I'll try to reproduce the symfony controller gaps in coverage in a public repo and link it here (I'll add some ansible provisioning and a vagrant file to ensure the same version runs on that example repo). Seems like this was fixed as my tests are now reporting 100% coverage. Glad I found this, I have the exact issue. What did you do exactly to fix the issue? I'm on PHP 7.1, PHP unit 5.x X. Not sure which version xdebug. Should I upgrade PHP unit 6.x X and xdebug? @wired00 it was fixed in Xdebug 2.5.5, don't know if you need to update PhpUnit too or not. Ok Great, for the benefit of others. I'm on OSX and fixed by going from xdebug 2.5.4 > 2.5.5.
now running 7.1.8 with Xdebug 2.5.5 and coverage is working perfectly. I have same problem with PHP 7.2 and XDebug 2.6. If I run PHPUnit with phpdbg -qrr ./vendor/bin/phpunit, coverage is normal (100%).